Everybody likes a superhero movie-themed online slot machine and which character could be better as the main man than the Incredible Hulk. You may well feel that you have encountered another Hulk-themed game elsewhere and you would be correct; both Cryptologic (who created this slot) and Playtech both have licensing agreements to make slots based on Marvel comics characters. This version came first and lacks a little bit of quality when compared to the more recent Playtech version but it’s enjoyable nonetheless and the bonus features are strikingly similar. There are five reels and twenty five paylines and the low value symbols are the standard playing card ones, albeit bomb and bullet damaged. The higher value symbols are Hulk-related and so we have breaking glass, a broken gun, a S.W.A.T vehicle and a nervous looking soldier. The scatter symbol is a nuclear explosion and the wild symbol is a huge Hulk eye. There is just the one bonus game in the Incredible Hulk and it’s triggered by landing three or more of the nuclear explosion scatter symbols anywhere on the reels. You will now get to play a mini-game which involves flinging things at helicopters, always a fun diversion. You are presented with a screen showing the back of the Hulk and on the right a number of items available for chucking including a car, a fire hydrant, a motorbike, a telephone booth and a bin. In the small screen above the items is a top down view of five helicopters and you can se the same helicopters from the front above the Hulk. You will now get the chance to pick an object and hurl it at a helicopter; this will result in a number of free spins and a multiplier. You can accept this prize or have one more shot – this time you must accept it. 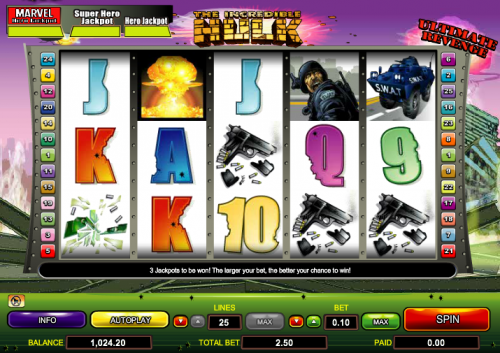 The free spins you’ve won will now take place and any money won will be subject to the multiplier you received. As one of Cryptologic’s Marvel slots, this game is subject to the company’s Marvel progressive jackpot; it’s awarded randomly in the game and all players have a chance of winning the Hero, Super Hero or Marvel Hero jackpot. This is a slot well worth a few minutes of your time, especially if you’re a fan of Marvel slots in general; you can wager as little as €0.01 on one payline up to €250.00 with everything maxed out.